Many animals use visual signals to scope out potential mates. In a new paper in Molecular Ecology, Sandkam et al. (2015) demonstrate that the variation underlying preference in female guppies could be explained by simple changes in expression and coding of opsins. 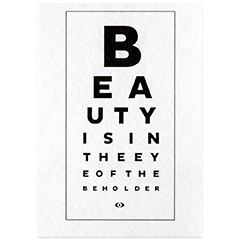 Beauty really may be in the eyes of the beholder. Populations can diverge rapidly via sexual selection, but there are very few systems in which the variation in female preference is replicated in a consistent manner across populations. Trinidadian guppies are a classic model system exploring the evolution of female mate choice. In response to environmental factors, such as predation, female mate preference varies both within and between populations. In guppies, there are nine opsin proteins in which each is coded by a single gene and grouped by the light they detect. Changes in gene sequence and expression could alter the tuning of these sensory systems. Guppy vision differs across populations in a consistent manner based on the opsin expression and allele frequencies in natural populations. Guppies in low-predation populations express more long wavelength-sensitive opsins than do guppies from high-predation environments and low-predation populations are almost fixed for an alternative amino avid known to affect retinal tuning. Their data suggest that much of the variation in female preference can be explained by differences in the visual system. populations with stronger female preference for red/orange coloration invest a strikingly greater proportion of their color vision in detecting those colors and are strongly differentiated for sequence variants [which are known] to change spectral sensitivity. This entry was posted in Coevolution, evolution, Molecular Ecology, the journal, natural history, population genetics, speciation, Uncategorized and tagged gene expression, gene sequence, sexual selection. Bookmark the permalink.